The PL880 is a world band receiver with a comprehensive frequency coverage including AM/FM, long wave, shortwave, and single side band (SSB). External shortwave antenna. SW (& FM) antenna jack. FM: 64-108 MHz. Featuring a high-performance audio system and rugged design, the M18 Jobsite Radio is built to amplify and survive the jobsite. Milwaukee M18 Jobsite Radio. Power Source: A/C or M18 RedLithium battery (not included). LARGE CCRadio SW Portable FM/Stereo/AM/Shortwave Radio by C.Crane. Condition is Used.works great. Sold as is see pictures. Shipped with USPS Mail. Sony ICF-EX5MK2 Multi Band. Condition is Used. Shipped with USPS Parcel Select Ground. Grundig AM FM Shortwave Portable Radio S350DL High Sensitivity World Receiver. Condition is Used. Please look at the pictures. Radio was tested and works properly. Comes with AC adapter. It's the perfect size to slip in a pocket or purse. Receives all 7 NOAA weather band channels. Blue backlight changes to red during alerts. Red alert LED blinks slow for standby & fast for alerts. Standard AM/FM radio reception. VERY GOOD CONDITION PERFECTLY WORKING. This compact, lightweight portable radio lets you listen to AM/FM radio wherever you go. And with its classic styling, it will look good in your pocket. Requires 2 "AA" batteries, not included. Radio Shack AM / FM Pocket Radio. Vtg Sony Walkman Am Fm Stereo Srf-33w Box 1980s Rare Retro Portable. Condition is Used. Shipped with USPS First Class Package. Both the AM and FM radio components work very well and sound great! The overall condition of the radio is very good with minimal wear. The antenna on the radio is also in great condition with no wear. Built-in speaker and headphone jack. VERY GOOD CONDITION - CONTAINS MINIMAL SIGN OF WEARS OR SCRATCHES -. Uses 4 “C” batteries (included, installed in the radio) or AC power (cord included). Headphone jack. Antenna in excellent condition. The KA700 has a wide range of band reception including AM, FM, and NOAA weather stations. In addition, the KA700 model has a build in MP3 player where you can play music either with Bluetooth or SD card. Trending at $73.98eBay determines this price through a machine learned model of the product's sale prices within the last 90 days. Color is Walnut. FM antenna is not with the unit. The latest & most advanced model has arrived from Tecsun. 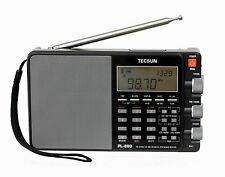 The PL-660 is a world band receiver with a comprehensive frequency coverage including AM/FM, longwave, shortwave, single side band (SSB) and the aviation band (118-137MHz). 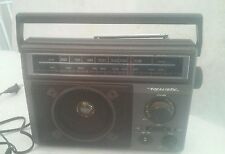 Pre-Owned Grundig FR-200 FM/AM/Shortwave World Band. Have No Effect On Radio Performance. You Win, So Do Not Ask! We Do Not Accept Cancellations If. 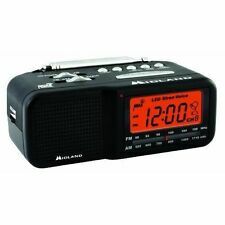 Grundig Platinum Traveller - FM/AM/SW - Clock Alarm - Digital Display - Stereo. Condition is Used. Shipped with USPS Priority Mail. It features dual conversion AM/SW circuitry for exceptional sensitivity and image rejection. External antenna jack for shortwave, FM, VHF air band. The right side of the radio has a 3.5mm Input/Output jack. The KA600 has a wide range of band reception including AM, FM, longwave, shortwave and NOAA weather stations. SW (shortwave): 2,300-23,000 KHz. NOAA Weather: 1 – 7. Solar Panel Power: Under the direct sunlight, the solar panel will power the radio without a problem. Trending at $54.75eBay determines this price through a machine learned model of the product's sale prices within the last 90 days. Enjoy AM and FM radio virtually anywhere with the Sony ICF-P26 Portable AM/FM Radio. You can use the built-in 100mW speaker or attach headphones to the 1/8" headphone jack. The external antenna can extend up to 17" to help you find your favorite station. The PL880 is a world band receiver with a comprehensive frequency coverage including AM/FM, long wave, shortwave, and single side band (SSB). SW (& FM) antenna jack. FM: 64-108 MHz. Alarm by radio, and with the automatically alarm stopper within 1 - 90 minutes. 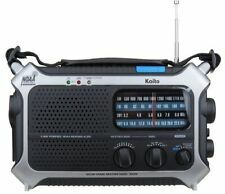 The Kaito KA1101 is a dual conversion portable radio covering AM/FM and Short Wave. The special designed PLL circuit has a very high sensitivity and low noise levels. AM coverage is from 522 - 1710 kHz. Insignia Tabletop HD Radio with Antenna and Digital Display - Black - NS-HDRAD2. By Insignia, their Tabletop HD Radio with Antenna and Digital Display. Model: NS-HDRAD2. - FM tuner:Lets you listen to your favorite stations. Note: USB cable and battery is not included, color could be yellow or orange. NOAA Alert Mode. LED Flashlight. FM: 88MHz to 108 MHz. Radio Features Digital 7-Channel Weather Band. Here is the classic C Crane portable radio in exceptional condition. Large size 11.5 x 8 x 3. World Band PLL It is full featured and has beautiful rich sound with nice bass. Some of the features are: Wide and narrow SW. AM, SW1, SW2, SW3. Dial speed control SLOW, FAST, HOLD Dual Time Bass, Treble control Snooze coax and wired antenna inputs plus extendable telescoping antenna. Accepts AA or D batteres. (4). Rechargeable batteries can be used. antenna options including external antenna connections. Has twin coil ferrite technology Stores 50 stations This is the standard for Shortwave radio hard to find in this condition. Eton weather radio in USED-VERY GOOD condition. Everything functions. Connects through Bluetooth. Also has headphone and AUX ports. USB out port for charging cell phones. AM/FM or weather band tuning. I realize that unforeseen issues my arise. Failure to comply can result in the denial of the claim. Sony AM / FM / Weather band pocket radio. Works great but missing belt clip and battery cover. This is a gently used SONY ICF-38 AM FM 2 Band Radio AC or DC Power 9" Portable Radio. Serial Number 558664. Tested and Working. Antenna is straight. Overall in really good condition. See Pictures. 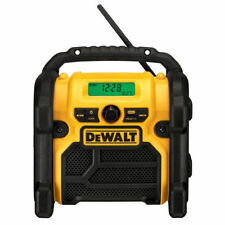 DEWALT MPN: DCR010. This Bluetooth speaker is jobsite tough and produces high-quality sound. You can also plug devises directly in with the auxiliary input. Enjoy rich stereo sound with extended bass from dual 3-in sub woofers. Sony ICF-38 AM FM 2-Band Portable Radio Tested. Condition is Used. Shipped with USPS Priority Mail. Radio is in very nice clean working condition with some very light scuffs on it. Please refer to the pictures. It has been tested and works great. Please visit my store for more vintage and modern items as things are added daily. I do combine shipping when possible. From a smoke free home. Ships within 24 business hours upon receipt of payment. Sangean WR-2WL Tabletop Radio with wood case, RDS tuning. In good working condition, has some scratches and scuff marks. Shipped with USPS Priority Mail. 1995 Radio Shack AM/FM/TV Portable Handheld Transistor Radio - Model # 12-617. Tuning Range: AM 530 - 1710 kHz, FM 88 -108 MHz. Antenna is in Excellent Condition. TV2 179 - 216 MHz (Channels 7 - 13). 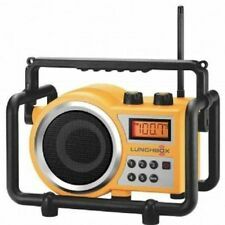 PRUNUS Portable SW / FM / AM（MW）/SD/USB MP3 radio with neodymium speaker. PRUNUS Portable SW/FM/AM（MW）MP3 Micro SD USB radio with bass speaker. 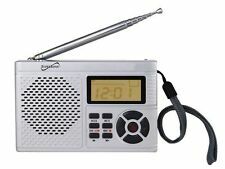 A portable radio will allow you to listen to a variety of radio stations. A portable AM/FM radio can ensure you always have access to music, the news, weather reports, and much more. 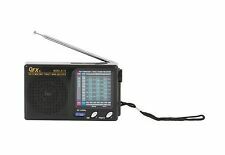 What is a portable AM/FM radio? A portable AM/FM radio will allow you to take the radio anywhere you want to go. It will allow you to listen to AM and FM stations at any time. You will be able to get a signal virtually anywhere without depending on an app or power from your phone. There might be a charge cord available, or the radio might run on batteries only. The size of the unit varies by model. What types of portable radios are available? You will find that there are many portable radios available. This will allow you to choose a radio with a good speaker and a strong enough signal for where you will be listening. Clock radio: A radio is paired with a clock to know the time and to set an alarm. Emergency: Emergency radios might offer a hand crank to power them. Sometimes, they also have a flashlight. Headset: Headsets can have a radio built into the headphones. Sport: Sport models are rugged and might also be waterproof. Pocket: The radio is small enough to fit in your pocket and can transmit to Bluetooth headphones. Built-in Speaker: Some radios also include a built-in stereo speaker. This is useful when you don't have a pair of headphones with you. What signal types are available? The way that you get a signal is by using the antenna. Many radios have an antenna that you can extend and adjust to fine-tune the signal. You can also change radio stations by using the tuner. AM/FM: Just extend the antenna, switch on the device, and find the station you want to listen to. Digital: You might be able to get a digital signal if the radio connects to Wi-Fi. Some models are more rugged and have signal boosters built in. These can help you access stations you wouldn't be able to due to interference or distance. What are some features in an AM/FM radio? AC-operated: You will be able to plug the device into an outlet. Alarm: Set an alarm to help you wake up in the morning. This is especially useful on camping or road trips. Hand crank: The hand crank acts as a way to generate electricity in an emergency. Solar energy: Some radios will use the sun for energy, potentially eliminating the need for batteries or power outlets.